Oak Leaf Farm is located in Mebane, North Carolina. Conveniently located near the I-40/85 split in Orange County, close to Chapel Hill, Durham, and Burlington. Oak Leaf Farm has been in operation since 1995 and is owned and operated by Susan Hart. Susan has been passionate about horses her whole life. She started riding as a youth, taking lessons in the hunt seat style in Avon, CT. After a brief sabbatical in college she started riding again, studying and competing locally in the Hunter and Jumper arena in Maryland. Susan decided to broaden her knowledge and sought out dressage master Helene Asmis of Dedication Farm in Sykesville, Maryland. With Helene's guidance, Susan gained more knowledge and technical skills in the fine art of riding. Helene Asmis, daughter of Col. Heinrich Asmis, studied in Europe with Egon von Niendorff and Major Paul Stecken. Susan became a long time student of Ms.Asmis and learned the art of Baroque Classical Dressage with emphasis on feel, timing, and lightness. 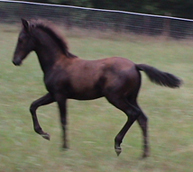 Susan competed successfully in Halter Classes, Long Lining, and under saddle in Dressage as well as Jumping. Susan later studied Parelli Natural Horsemanship to gain a better understanding of the nature of the horse and how to gain a horse's trust and respect through the horse's natural language. 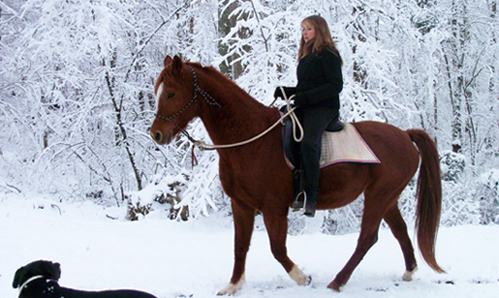 Susan's current interests are in riding as a performance art and passing on her unique knowledge of equestrian art to her students. the USEF, USDF, NCDCTA, ERAHC, and PNHSC. Susan is the Vice President of the Eastern Region Andalusian Horse Club. She also serves as the Ringmaster alongside National and Internationally recognized judges from the US, Spain and Portugal at ERAHC's Horse Shows. We want to make the world a better place for both horses and humans. We acheive this by providing education to create a new understanding of our equine friends and provide the environment to support it. 'There is something about the outside of a horse that is good for the inside of a man."